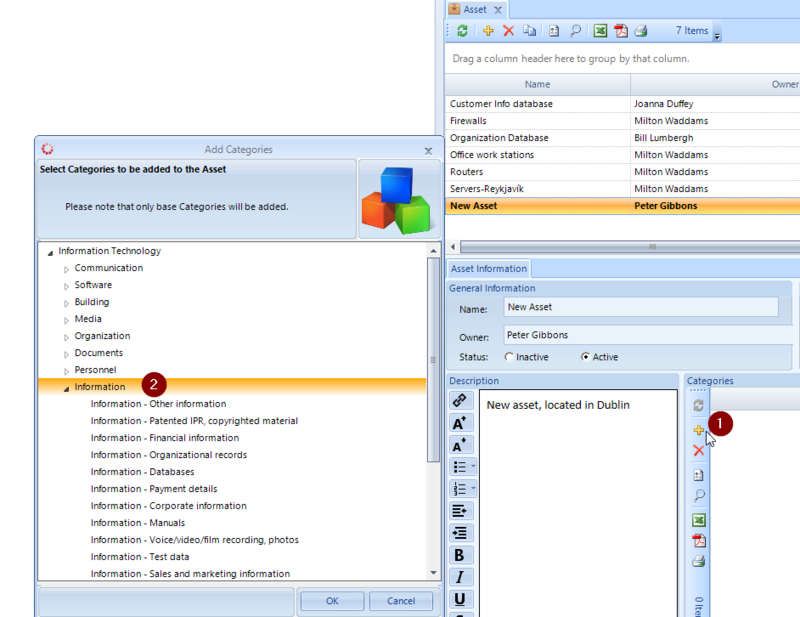 Categories serve as the link between Assets, Threats, and Mitigating Controls in RM Studio. RM Studio comes equipped with default Categories. However, you can define your own Categories, and remember to link the applicable Threats to the new Categories. You can also simply modify the default Category library and only need to link the custom Categories. Categories are defined as Parent or Sub-category. The default setting links the Threats to the Parent Categories only, because any link to a Parent Category is automatically linked to the Sub-categories contained. Click on the ‘+’ button to add a new Parent Category, then enter the name and description in the appropriate fields under the Category Information. To add a new Sub Category, first select the appropriate Parent Category from the list, then click on the ‘++’ button. Next, type in the name of the Sub-category and the description. When new Assets are added to the library you need to assign them to a Category. The Category will then connect the Asset to the Threats associated with that Category. This action is performed in the Assets. Under the Asset from the Common module, click the ‘+’ button in Categories (lower, right-hand side) to open the Add Categories pop out window. Select all the applicable Categories or Sub-categories for the selected Asset, then click ‘OK’ button to apply. *Tip* Save time by pressing and holding the ‘Ctrl’ key on your keyboard, then left click to select all of items from the list you want to include.